Instant gratification is one of the great pleasures of the digital distribution age. The moment I declare this blog post finished and push the appropriate button, all y'all out there can read it. Unlike the olden days, you don't have to wait for the mailman to deliver your issue or go to the store to pick up a copy off the newsstand. It's all kinds of awesome. But this instantaneous satisfaction hasn't quite proliferated into game releases—at least, not from major publishers. Case in point: Bethesda's blog reported today that Fallout: New Vegas has gone gold. “It's done!” the post proclaims, presenting as proof a photo of an awesome-looking and technically edible (because really, who actually eats fondant?) 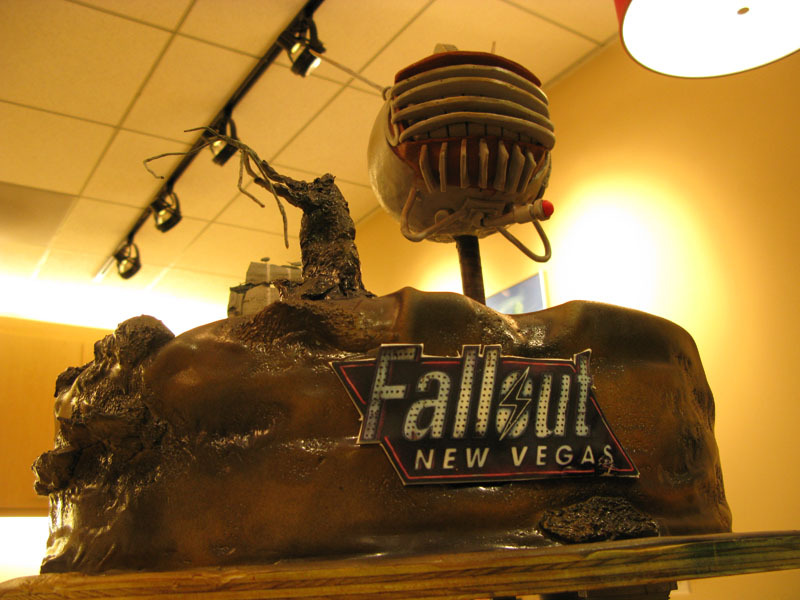 Fallout-themed cake that celebrated both the game's completion and the birthday of Obsidian designer Robert Lee. They're eating cake! It's official! The game is ready to be played at last! Point me to the download button, and pass me some cake! But of course there isn't one, and it's largely the fault of the brick-and-mortar stores that still command the majority of game sales (less so on the PC, but this is a multiplatform game). Before we're allowed to download the game, we have to give the retailers a head start—in this case, a 17-day head start, until the game's official release date of October 19. The cake will probably never arrive—and for the failure to develop a method of digitally delivering cake, I blame science. Why do we have to wait until the 19th? Because Fallout: New Vegas has been shipped off to the manufacturing plant, where thousands of elves or something probably hand-carve game DVDs out of what are most likely unicorn hooves to be shipped out to stores around the world. If Bethesda were to allow the game to go on sale online before it arrives at stores, driving customers online rather than to the mall, retailers might retaliate by not carrying the game or giving it poor shelf placement. But when I see "It's done!" and then flip over to Steam and see that I have to wait more than two weeks because the retail kids can't keep up, it summons up an irrational, petulant rage. “But I want it nooooooooooow! ” Immature? Impatient? Certainly. But when there's a game you've been looking forward to for a year that's completely finished somewhere, and the only reason you can't play it right now is because Wal-Mart is twisting arms to protect its turf, it builds a certain amount of resentment toward the establishment and causes whiny blog posts. What's the solution? Short of a revolution against retailers, maybe publishers could get out of the habit of announcing to the world that a game is ready weeks before it goes on sale. I mean, "gold" doesn't quite mean what it did before the days of the mandatory day-one patch, anyway, so why flaunt it? Or maybe, just maybe, I could man up and tough it out for a couple more weeks. Who's got a few good Fallout 3 mods? As a side question, how many of you guys who are planning to buy Fallout: New Vegas are going to do so at the store versus online?